Home » Tech Tips » Windows 10 » How to View Hidden Files In Windows 10/8/7? 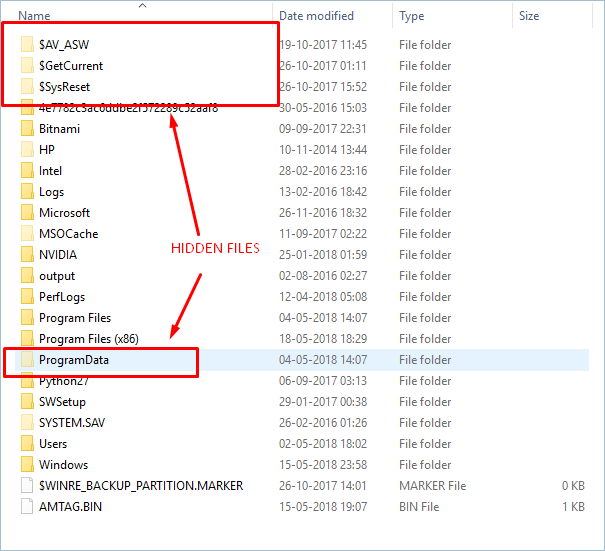 How to View Hidden Files In Windows 10/8/7? Windows has lot of system files and deleting them accidentally will result the PC from stop working. In order to avoid this Windows has a default feature to hide or show important files. You can also hide your personal files to prevent others viewing them. Remember whether it is a system file or your personal file, you can hide them but it is very easy for anyone to unhide and view. So, if you don’t want others to view your content then consider protecting with password instead of simply hiding. 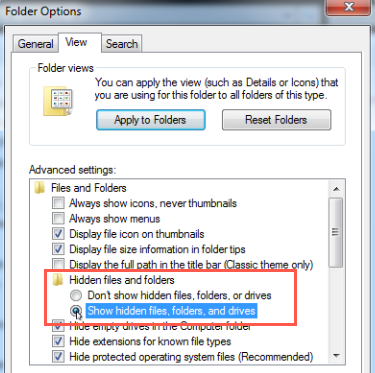 In this article let us learn how to view the hidden files in Windows 10. The process is same in previous versions of Windows 8. 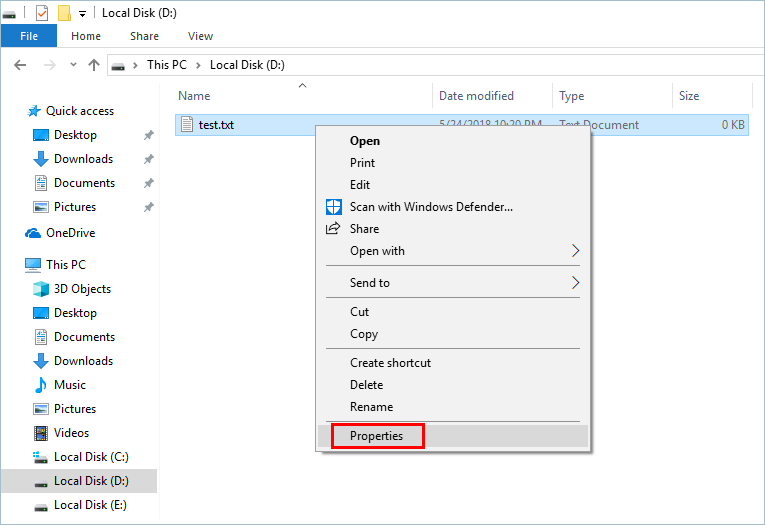 There are two methods you can view the hidden files in Windows 10. First of all, you need to open that folder where you want to look for the hidden files. In our case, we are going to look for some default hidden files in C drive. When you are inside the folder, you need to go to the top of the file manager and click on ‘View’ tab. Now you’ll see the ‘Hidden items’ option as shown below. Just enable the check box. You’re now able to see all hidden folders and files in Windows. Press ‘Win + E’ to open File Explorer and click on ‘View’ tab from the menu. Now, you’ll see the last option called ‘Options’. Click on that and open ‘Change folder and search options’. Now you will see “Folder Options” dialog box open. Click on the ‘View’ tab and look for ‘Hidden files and folders’ section. 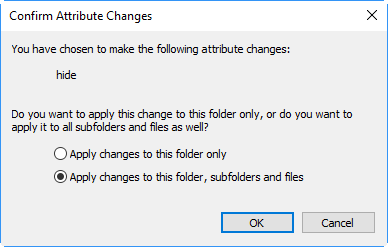 Turn on the ‘Show hidden files, folder and drives’ option and then click ‘Apply’ to save your changes. After you find the file you want and complete the task, we strongly recommend you to disable viewing hidden files. This will help to avoid you or someone wrongly deleting them. The process for viewing hidden files is bit different in Windows 7. Open the folder where you want to view the hidden files. When you’re inside that folder, you’ll see ‘Organize’ button at the top and click on that. You’ll see ‘Folder and Search options’ to folder options window. 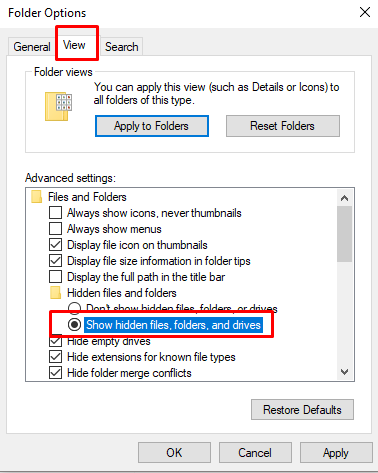 In the advanced setting box, you have to click on “Show hidden files, folders and drives”. Press ‘Apply’ and then ‘OK’. Now, you’ll see all the hidden files and folders in your file explorer. 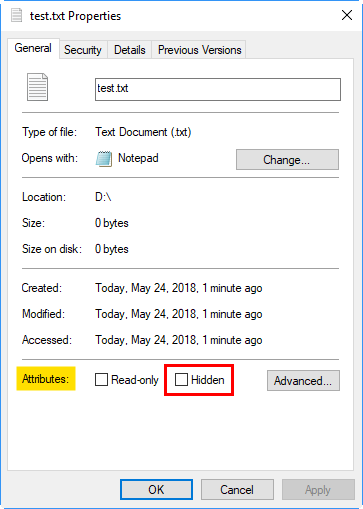 You have seen how to view the hidden files, now that you may wonder how to hide any of your personal file in Windows 10? It’s very easy. Right click on the file and open ‘Properties’ dialog box. Under ‘General’ tab, check the ‘Hidden’ box against ‘Attributes’ section. Click on the ‘Apply’ button and then ‘OK’. Now the file will disappear from view and hidden. The folder may contain many files and subfolders. Right click on the required folder and choose ‘Properties’ option. Check ‘Hidden’ and click on ‘Apply’ button. Now Windows will prompt you to confirm whether you want to hide only the folder or all files and subfolders inside the folder as well. Choose appropriate option you want and hide the folder content. Learn how to view hidden .htaccess file in MacBook.